Looking to run your own podcast? Then you’ll need a microphone. You can use a cheap headset microphone, but you’re better off looking for a decent desktop microphone. You can now get mics that plug directly into the back of your computer via USB. 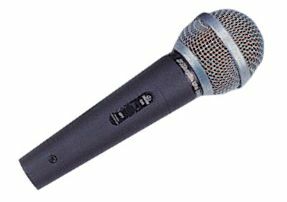 The mic pictured here costs under £30 – The Professional Dynamic Vocal Microphone from Maplin. To connect this to a PC, you’d normally need to use a mic pre-amp into your soundcard, or to go through a mixer, but a simpler solution is to use an XLR-to-USB adapter cable, pictured below. 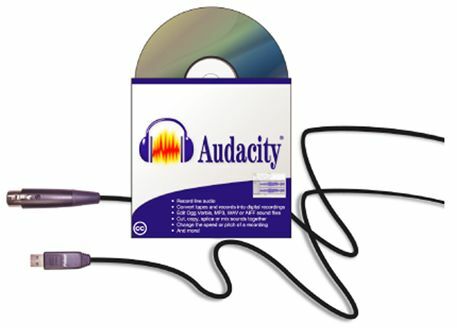 This lead also comes with the Audacity software package (which is available free anyway), and is available from Maplin.co.uk. Plug one end into the microphone and the other into a spare USB slot, install the driver software and you’re away. 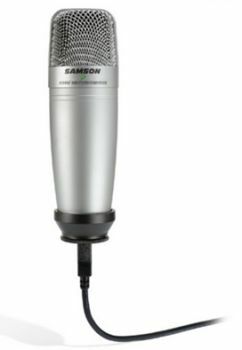 The Samson CO1U USB Microphone makes podcasting pretty easy – no need for a mixer or a pre-amp, this mic just plugs straight into a USB socket without the need for adapters – it offers pretty impressive performance for vocal recording.